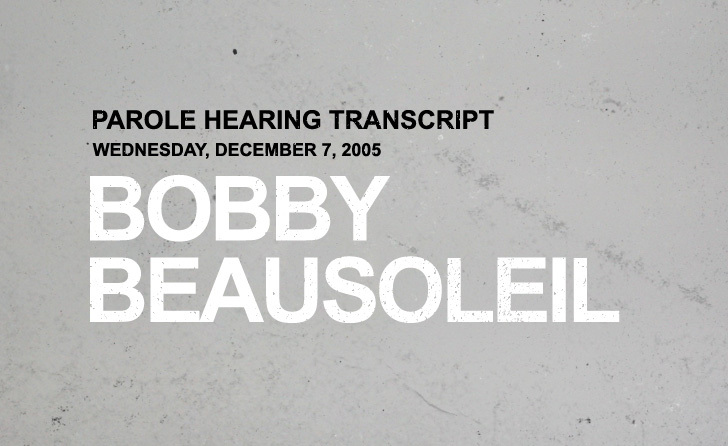 Review of the most recent parole consideration hearing transcript of Robert Beausoleil, dated May 11, 2000, has revealed inaccuracies and confusion regarding the commitment factors. In order to fairly address the (indiscernible) factors of the offense, and by extension Mr. Beausoleil’s rehabilitation, Mr. Beausoleil request that the Board incorporate this statement by reference into the current and any and all future proceedings. The commitment case factors as described below are based entirely on previous parole hearing transcripts, Board reports and psychological evaluations. ‘Statement of Facts’ – on the night of Friday, July 25, 1969, approximately 45 hours prior to the fatal stabbing of the victim, Gary Hinman, Robert Beausoleil went to Hinman’s residence to buy drugs. Hinman was, at that time, dealing Mesculine that he made himself. Beausoleil was buying drugs on behalf of members of the Straight Satan’s Motorcycle club who had supplied money for the purchase in the amount of $1,000. Danny DeCarlo, who would later testify as a witness to Beausoleil, was a member of the Straight Satan’s club and an active participant in the drug transaction. Beausoleil delivered the mesaculine he had purchased from Gary to the Straight Satan’s at Spahn Ranch where Danny DeCarlo resided with his girlfriend, Susan Atkins, who would become co-defendant in Beausoleil’s case. DeCarlo and other members of the Straight Satans then took the drugs to Venice Beach for a party involving several motorcycle clubs that was to take place the next day. On Saturday, July 26th, DeCarlo and other members of the Straight Satans, accompanied by members of the Satan’s Slaves and Hell’s Angels motorcycle clubs, returned to Spahn Ranch and confronted Beausoleil. They accused Beausoleil of conspiring with Hinman to burn him for the money for selling them bad drugs. The bikers roughed up Beausoleil and threatened him with a knife. Beausoleil told the bikers that he did know the drugs were bad and promised to get their money back from Hinman. DeCarlo and co-defendant, Bruce Davis, told Beausoleil that they would drive him to Hinman’s residence to make sure that he did. Two young women, co-defendants Atkins and Mary Brunner, who were initially unaware of the difficulites between Beausoleil and the bikers and Hinman, came along “for the ride.” Upon arrival at the Hinman residence, Brunner and Atkins went ahead into the house to visit Hinman with whom they had more then casual relationships. Davis then gave Beausoleil a 9mm pistol. Davis and DeCarlo instructed Beausoleil to keep the gun concealed, but to produce it if Hinman failed to cooperate and return the money. They told Beausoleil to phone them at the Ranch when they obtained the money and they would return to pick him up. Davis and DeCarlo then left with the car. In addition, Beausoleil was carrying a knife in a sheath on his belt. Beausoleil confronted Hinman about the allegedly bad drugs and commanded the return of the $1000.00 he had given him the day before. Hinman claimed that the mesculane was not bad, and in any case that he had already spent the money. Beausoleil became agitated and pulled the gun out and threatened Hinman with it. He struck Hinman with the gun two or three times. Hinman produced his checkbook to prove that he had already spent the money. Convinced that Hinman was telling the truth, Beausoleil handed the gun to Atkins and told her to keep in trained on Hinman and not to let him move, that he was going to go into the other room in search of something of value that he could give to the Straight Satans in lieu of the money. While Beausoleil was out of the room, Hinman lunged at Atkins and took the gun away. Atkins cried out and Beausoleil ran back into the room. He grabbed Hinman’s arm and began to fight with Hinman to gain possession of the gun. While the two men were wrestling over the gun, one of the two female co-defendants telephoned Spahn Ranch and apparently and unidentified person that there was trouble, that Hinman had taken the gun and that he and Beausoleil were fighting over it. During the struggle the gun discharged. The bullet pierced the kitchen sink without injuring anyone, but the sudden shock of the gun’s loud concussion enabled Beausoleil to regain possession of the gun. Davis demanded Hinman give him the gun and Hinman indicated to Davis that Beausoleil had the gun. Beausoleil returned the gun to Davis and Davis expressed annoyance that the gun had been jammed. Manson angrily told Beausoleil that he had made a mess of things and that he needed to get it cleaned up. He told the two females, who were members of his commune, to help Beausoleil take care of Hinman. Manson and Davis then left. Beausoleil spent the rest of the night, and most of the next day, with Hinman, attending to his injury and talking to him in an attempt to convince Hinman that – ” There seems to be a typographical error here. “In an attempt to convince Hinman that the wound was not very serious and would heal without the need of going to see his doctor. Beausoleil feared Hinman would inform on him if he went to the hospital for medical treatment. Hinman became increasingly adamant about wanting to get professional treatment for the injury. Beausoleil phoned Spahn Ranch for advice on what to do. Manson came to the phone and told Beausoleil that he was on his own and hung up. Hinman made additional demands to be allowed to go to the hospital. In a state of panic and desperation Beausoleil made the decision to kill Hinman to prevent him from telling what he knew of Beausoleil’s involvement of the drug deal and the assault. Beausoleil stabbed Hinman once in the chest and when Hinman did not immediately fall he stabbed him a second time. In court testimony the coroner said that the second stab wound was almost instantly fatal. Beausoleil has stated that neither of the two female co-defendants had any foreknowledge of the fatal assault and were out of the room when it occurred. The females had seemed shocked. Beausoleil asked them to help him remove evidence of their presence and to take measures that might help him evade detection by the authorities. Hinman was known to associate frequently with radical militant (indiscernible) on the UCLA campus and Beausoleil decided to try to make it look as though Hinman had been killed by some of these other associates by burning some of Hinman’s Marxist newspapers on the floor, and by drawing ‘political pig’ on the wall in the victim’s blood. The three left Hinman’s residence at nightfall on Sunday, July 27th. DeCarlo and members of the Straight Satans accepted the old VW van as repayment for the allegedly bad drugs and took it to Venice Beach. It was subsequently found in Santa Monica. Beausoleil was arrested in San Louis Obispo on August 6th. He had been driving Hinman’s other vehicle at the time and it had broken down on the freeway. The knife used in the slaying of Hinman was in the vehicle.” This is dated May 30, 2003, signed Carolyn M. Hagen, attorney for Robert Beausoleil. Is there more where he discusses Tate and the buntline??? Beausoleil was not present at the Tate murders, only Hinman.